Mayan ruins and swimming in a Cenote! Today was a great adventure day! After an hour and a half drive to Tulum, we hiked around the Mayan ruins and was it ever impressive! The back drop of the turquoise blue Caribbean sea was breathtaking and just being at the ruins gave you a feeling of reverence. On the way back we discovered a cenote called “casa cenote” in Tankah and had a great swim and snorkel! I really wish I had my stand up board because it would have been a great paddle! Tomorrow is another day so stay tuned! 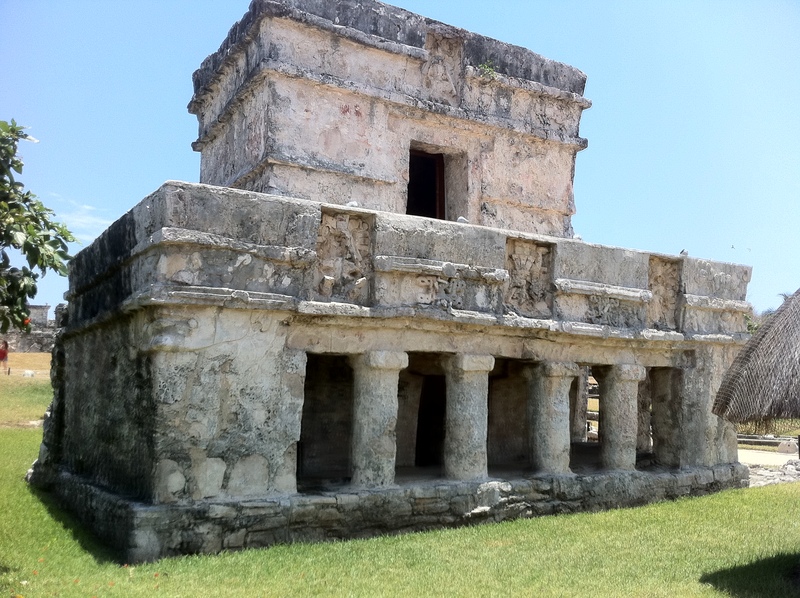 12 Responses to Mayan ruins and swimming in a Cenote! awesome, wish i could see all that, mahalo for sharing…you on the other hand missed some primo paddling today, clear as a diamond till the wind came on super strong and forced everyone low on their boards…o how quickly the sea can change! I know you are on vaca (and Tulum looks amazing!) but I have been meaning to ask about some Maui stuff 🙂 I hope you have an amazing vaca in Mexico!!!! Let’s see, a shubu is an inflatable, right? Costco on Maui has one that coleman makes and it fits in a duffle bag. A paddler friend made a comment to me about the inflatables, “what if a shark took a bite of your board”? Hmmm… I hadn’t thought of that. True, they are out there, it is a fact, and if a shark just happened to try a taste of your board? Yup, I guess it would deflate. On that thought, inflatables in the ocean may or may not be a good idea! Rivers and Lakes would be fine, but the open ocean is another story altogether. Just a thought. Lahaina has a few places you could rent a board. I don’t live in Lahaina, so I can’t make a personal recommendation, but have you tried googling “paddle board rental/Lahaina”? I know of Kihei locations and definitely Kahului. What time does your flight arrive? You could rent in Kahului and drop it off on your way to the airport. Just a thought. Have a great time on Lanai, it is beautiful there! Will you be spending any time on maui? We won’t be on Maui much this trip, just for lunch on our arrival day and breakfast on our departure day. The rest will be on Lana’i this time, but we’ll be back later in the year for a visit to Maui. I’ve Googled rental places and did find some in Kahului, I was just trying to find one in Lahaina so I don’t have to strap it to the top of our shuttle ride 🙂 I found a place to rent on Lana’i anyway so it’s all good. That makes sense about the SHUBU – I don’t want to be a shark treat for sure. Was just thinking about it also because we are going to French Polynesia in September and I can’t find rental places there on the islands we are visiting, only on Tahiti so I thought I may get an inflatable for that trip. We’ll be in lagoons so hopefully only lemon sharks in there. I also wanted to ask what kind of board you have or what you think is good for the ocean? If you have a preference. Let me know where you are renting on Lanai (good information!) Let me know when you come to Maui next. One of my paddling friends told me she just got back from Lanai and she swam with lots of dolphins!!! You are going to love paddling in Lanai! Another paddling friend here has an inflatable and she does travel with it. I think it makes sense after my trip to Mexico where there was NO paddle board to be found! In fact, no one knew what a paddle board was! I know it will make it’s way to Mexico too because there were quite a few people “kite surfing”. It just might be awhile before that happens (hopefully by the next time I go there!) I am definitely going to start looking at the inflatables though. Polynesia is definitely on my list for places to visit and SUP. You will have to tell us all about your adventures and send photos! I’ll be sure to report on my trip to Lana’i and take some pix too. We’ll be there starting the 27th of May. I just got a great underwater camera that I am going to try out on this trip (Pentax Optio WG-1). I’ve heard good things so let’s hope. I’d like to see those Dolphins. We are renting boards from Lana’i Surf Safari. Nick, the owner has surfboards, paddle boards and body boards for half-day or full-day rentals. We go to French Polynesia the last two weeks of September so I’ll make sure to post about that too. My travel agent said SUP is taking awhile to make it’s way there. A few places in Tahiti have rentals but we are going to Moorea, Huahine and Bora Bora and so far I can’t find anyplace to rent there. I’ve got a post in the travel section of SUP Connect so I hope someone will give me some leads before the trip. I did want to warn you that my paddling friend did say they all got stung by jellyfish swimming on Lanai, so be on the lookout for that. I can’t wait to hear about your adventures on Lanai! I also wanted to tell you that before I bought my NSP board, I rented one that was 11′ 6″. It was very stable, but it was a bit more than I could handle on an everyday basis, so I went with the 11′ and it has been great! I decided I had to be sure that I could handle all of it by myself on a regular basis, since I did not want to depend on anyone helping me hoist my board up. (It’s an independence thing!) Thanks for the Lanai board rental link. I am so dreaming of visiting French Polynesia, especially since the ocean water is the same turquoise as was in Mexico on the Caribbean Sea. I have to say that I LOVED that white, white sand, and the turquoise water!!! Oh great! Jellyfish stings… not looking forward to that, but since we were speaking of sharks and inflatable boards check this out if you haven’t seen it. Yikes! Yikes is right! That Chuck Patterson is amazing, isn’t he? Do you know where this happened? the water looks pretty murky (of course, this is one of the number one rules of when NOT to go into the water!) Chuck Patterson is a dare devil, like so many of them. But I have to say that some time ago, I was out in the water when a 12 Ft. Tiger was prowling around. Apparently there had been some dolphins beaching themselves somewhere down the coast and I think that is what brought it around. The lifeguards went out on jet skiis and tried to scare it out to sea, which didn’t work as the shark just continued down further. They ended up closing the beaches for a couple of days after that and the ocean was perfect conditions for paddling! Grrrr. Oh well, I did stay out until the coast guard forced me to come in to shore, and I did get to see that bugger swimming really fast (away from me)! It made me really aware of just how fast they can swim! I’ve not seen one since, thankfully. It was here in California at San Onofre.